As one of the most celebrated destinations for premium denim in the world, Dutil offers everything from classics such as Levi’s to Canadian staples like Naked & Famous, fashion houses like A.P.C. and emerging brands including Doublewood Denim. Örling & Wu Home Ltd. 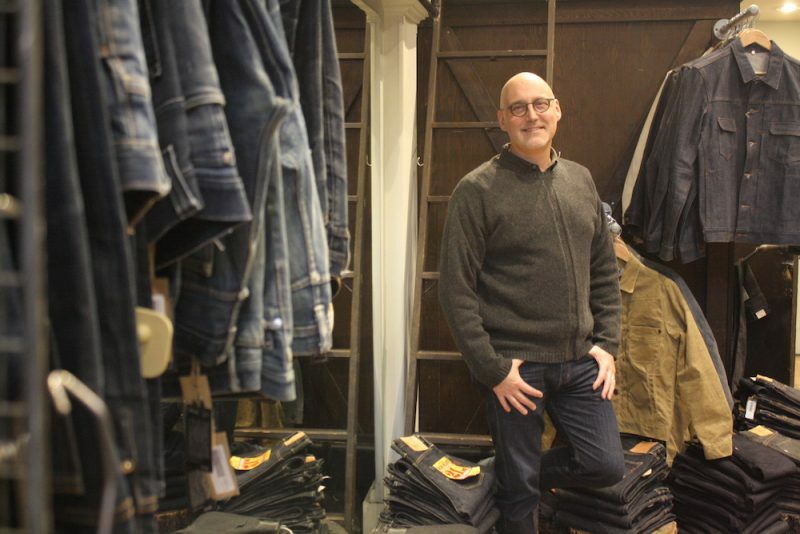 I am one of the owners of Dutil Denim store along with Eric Dickstein. The brand started about 10 years ago and we have another location in Toronto. How did I get here? That’s a tough one. I’m an American and was working in the US as a consultant for investment advisors. About 5 years ago, I was looking for a career change and at the same time, Eric was looking for a new business partner. As a child, I always dreamed of owing my own clothing store, so it all worked out as it was meant to. I would be happy just walking around looking at the architecture. Because it is so diverse here, we really are quite fortunate. We live in a place full of glass towers that all look the same yet Gastown is an area of the city in which each building is different, unique and full of character. I love the back alleys. They are interesting. And I love coffee. In 15 minutes, I could hit at least 3 of the what…like 20 coffee shops we have here in Gastown? It would depend on the day. Let’s just say I would start with brunch somewhere, most likely Nelson The Seagull and have the avocado toast. They serve delicious house made bread and imported coffee and one of the best breakfasts in the city. I would stop at some of my favourite stores like Orling & Wu and Parliament. I might go one of the nice galleries here, like Artspeak. It’s the independent feel of the neighbourhood. Everyone says: ‘Shop Local!’ but if you see who is promoting that, those places aren’t usually what I would define as a true independent store. In Gastown, you will find genuine independent stores such as Dutil, Neighbour, and Nicole Bridger for clothing and for house décor, places like Orling & Wu and Old Faithful. There are a lot of creative individuals here and you also have that same notion when you look at places like Chill Winston and Bauhaus. I am afraid for society if we have too many chains and big corporations in our neighbourhoods and those end up being the only choices we have. When you come to Gastown, you are given real choices, valuable opportunity and incredible exposure to a lot of independent thinking that you won’t find in most parts of the city. Back in February, we did a pretty cool thing with a local hip-hop artist named Brevner. We took the store apart and turned it into a hip-hop club for one night. The artist did an EP release and a concert and it was amazing. Lots of people came out, the music was awesome and the vibe was electric. I was really proud to be part of it. I am still trying to figure that out. It goes back to what inspires me; a sense of kindness, of community and being considerate of others in everything that you do.